Almost 2 years ago I became aware of Dr. Arnd Bernaerts’ insightful phrase, “Climate is the continuation of the ocean by other means.” From oceanographic observations, he has long been persuaded the climate changes because of ocean oscillations, and I learned a lot from him while writing a number of posts here collected under the category Oceans Make Climate. 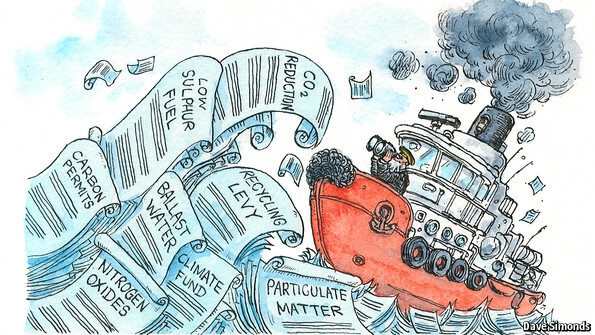 Arnd is also persuaded that humans are impacting on the oceans, and thereby upon the climate, but by obvious maritime activities and not by CO2 emissions. For his impertinence, he was “disappeared” from Wikipedia by the zealots there who purge that website from sources and information skeptical of global warming dogma. As happened in Soviet history, climate revisionists are rewriting history. Ironically, alarmists are crowing right now about Arctic ice extent being a little lower this year, while not mentioning most of the deficit is due to Barents Sea, and secondly to less ice in Bering Sea. 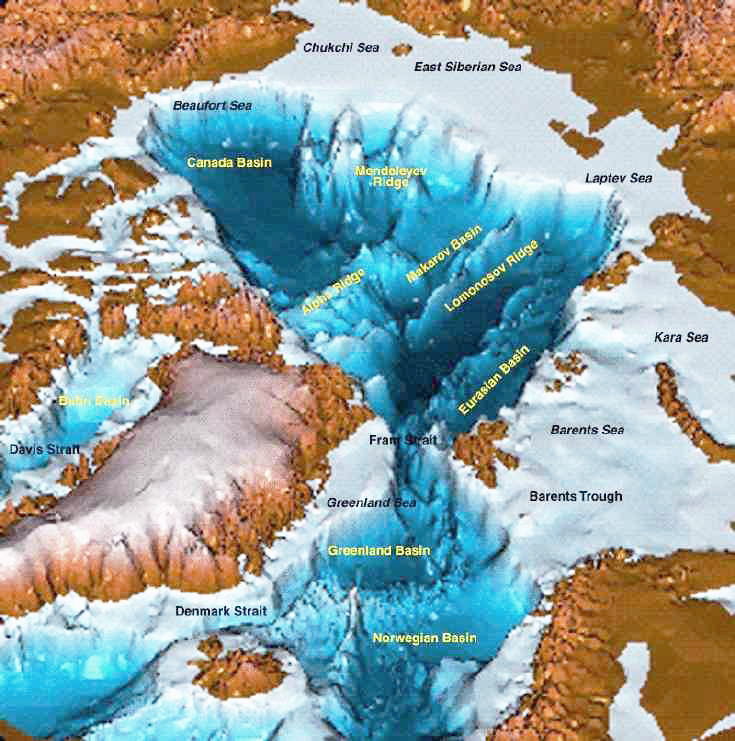 Both of those places are subject to extensive maritime activity–shipping, fishing, oil and mineral exploration and extraction, and icebreaking to support year-round operations. 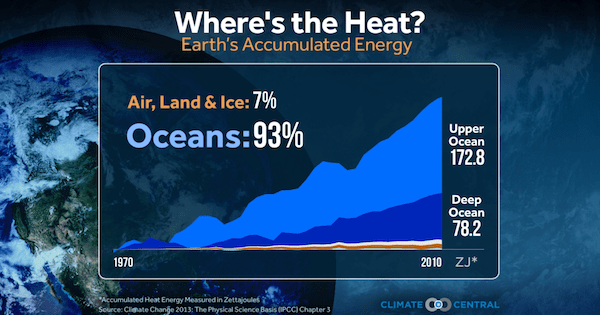 Bernaerts explains: Man-Made Ocean Warming? Yes, but it’s not CO2. Activist scientists, fixated on models and global warming, are indifferent to the correlation between WWI Atlantic naval warfare and unprecedented warming at Spitzbergen (Svalbard). Only an evidence-based scientist like Bernaerts is paying attention, as I have reported previously (here). Lachniet is properly circumspect in his writing and presentations, noting his findings pertain to a particular location, and suggesting several possible explanations for anomalous warming starting 1600 years ago. Yet his research was twisted into a climate change warning by journalists writing in the Las Vegas Sun (here). As crypto points out, this is not what Lachniet himself has said. He is as clear as anyone that warming starting in the Fifth century did not come from people driving SUVs, so some natural oscillations must be in play. (California terminology: SUV=Axle of Evil). My hope for 2017 is to begin seeing a regime shift in climate science from “Show me the money” to “Here are my data and work, Let the chips fall where they may.” Natural scientists have always owned a sense of awe alongside their curiosity, appreciating the enormity of the world they seek to understand. Dr. Bernaerts is right to remind us that even with modern technologies, our hard-won observational data is a minuscule sampling of oceanic and atmospheric activities. Any conclusions to be drawn should be put forward with humility. The dogmatic positions of climate alarmists are a disgrace to the profession. Footnote: Below are reprinted relevant comments from Bernaerts and crypto. Hi Ron, having been to the Great Basin/NV recently, I couldn’t resist asking: what have 3,500 Argo floats and other ocean sensors (image caption) and the Matt Lachniet „nevada-caves-climate-change” (link in one of your comments) in common? In – MHO – a lot, as they are both of little help to understand how to prevent anthropogenic climate change sufficiently. Recalling my visit of the Lehman caves a few days earlier or later (on 9th September) as Matt Lachniet, the cave formation was impressive, but hardly of any use for current concern. 3,500 Argo floats are certainly a more promising approach. But if one considers the dimension (& temperatures) in which they operate; nicely outlined recently at https://wattsupwiththat.com/2016/12/26/warming-by-less-upwelling-of-cold-ocean-water/, it is like reading from stalactite about AGW matters. The use of Argo floats is an achievement, but by far too small. 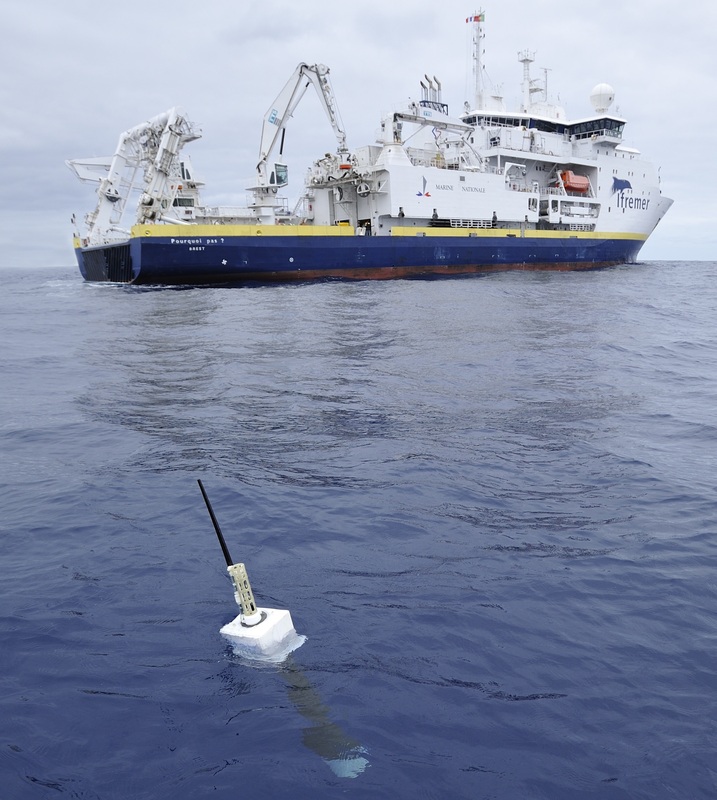 Observations below the sea surface would require a number of several hundred thousand, if not millions of devices (and the capability to process the data sufficiently). After all we need to understand the role of the oceans, and whether they bring a severe cooling, which is possible at any time. Thanks for pointing that out Ron. All I can say is unbelievable. The first thing I will point out however, is that those are not his words. Those are the words of the article writer. It is also either an outright lie, or a mistake. Another writer from the UNLV paper tried saying that Matt’s research suggests humans started changing the climate 1,600ybp, which again is not the case. I know Matt, and he delivered his 2014 study to my colleagues and myself personally. After we talked for a bit, and surprised him by identifying that change in trend before he did in his work, which he identified as being 1,600 ybp, I asked him what his thoughts were on co2. What I vividly remember is Matt pointing to his chart and stating that he doesn’t think anyone will be able to identify co2’s contribution to climate change until we reached the point of his finger, which is where we should start the long road back to glaciation. It may have 2ky or maybe it was 55ky, at any rate what he says in person isn’t exactly what you get from news articles and twitter feeds. “The lag behind NHSI of d18O variations suggests that the forcing is indirect. Several possible forcings are associated with the Great Basin d18O variations. First, it is clear that CO2 concentrations increase abruptly around the MIS 2/1 and MIS 6/5d transitions, which may explain some of the warming over Terminations I and II. However, Nevada d18O values drop steadily throughout the Holocene, whereas CO2 remains high and even increases slightly over the last 8000 years (Ruddiman, 2003). Similarly, the strongly low d18O values during MIS 5d and MIS 7 happen during intervals with intermediate to high CO2 values. That conclusion doesn’t strike me as coming from someone who believes co2 controls climate. There is a big leap from believing that co2 could cause increased heating of the atmosphere, and thinking co2 controls climate and/or we can control climate with co2. I have actually had people try to use Mr. Lachniet’s twitter account in an attempt to change the conclusion of his studies. Which is always entertaining. With the year end, media climate attack dogs are going after the Trump administration, throwing whatever they can (hoping for anything to stick). One thing they will surely trumpet is the temperature records for 2016 and 2015 as proof of dangerous man made warming. 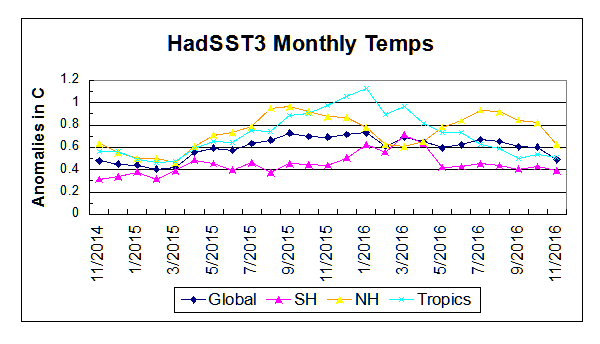 Note that higher temps in 2015 and 2016 are first of all due to a sharp rise in Tropical SST, beginning in March 2015, peaking in January 2016, and steadily declining back to its beginning level. Secondly, the Northern Hemisphere added two bumps on the shoulders of Tropical warming, with peaks in August of each year. Finally, note that the global release of heat was not dramatic, due to the Southern Hemisphere offsetting the Northern one. Much ado will be made of this warming, including claims of human causation, despite the obvious oceanic origin. Further, it is curious that CO2 functions as a warming agent so unevenly around the world, and that the Tropics drove this event, contradicting global warming theory. It is not climate change forcing migrations, but rather misguided climate policies like those in Ontario. Employers pushed to the wall by energy cost increases have to plan for growth in other jurisdictions where energy is reliable and affordable. In effect, Ontario businessmen who are succeeding against world competitors from the US, China and India, will be creating jobs elsewhere, a migration of employees directly resulting from CO2 hysteria. Byron Nelson has spent over three decades growing his manufacturing company in Ontario, only now to regret his choice. As he tours a group of reporters around his Leland Industries Scarborough plant where they build nuts and bolts for export to the United States and Europe, he explains he’s losing a battle with the province. 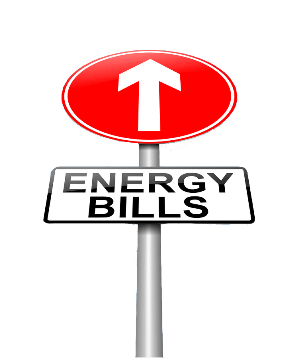 His hydro bills have soared over the past year and with Ontario’s new cap-and-trade system coming into effect next month, electricity and natural gas costs will likely spike by another 20%. That’s why Nelson — and other manufacturers in the province — are choosing to expand their businesses in the U.S. instead of at home. “By 1995 to 2000, China had moved in and we fought China on the world trade and won,” Nelson said Tuesday during a press conference of the newly formed Coalition of Concerned Manufacturers in Ontario. 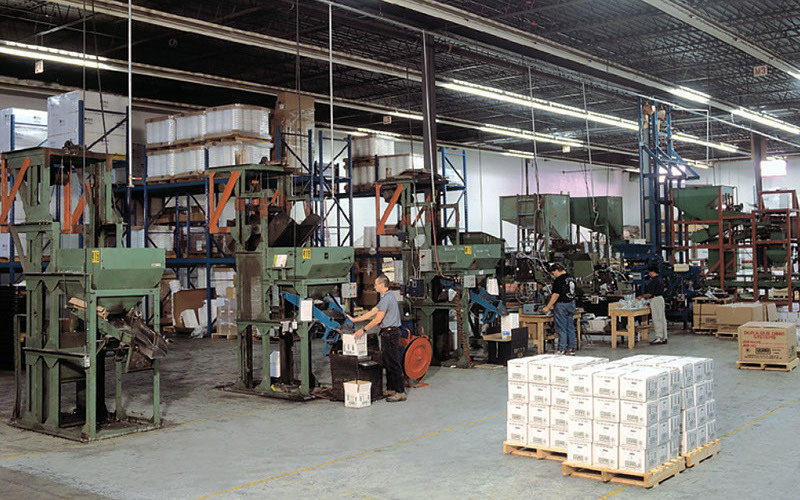 Jocelyn Williams Bamford — vice president of Automatic Coating Limited and spokeswoman for the Coalition of Concerned Manufacturers in Ontario — said Leland is one of many smaller and medium-sized Ontario-based manufacturers that are looking to grow and seriously considering investing outside of Ontario. “Ontario’s energy costs are rising so quickly many manufacturers are reassessing whether it makes sense to expand production in this province,” she said Tuesday in a statement. Bamford said manufacturers have become more competitive and have been able to reduce emissions at the same time because they have invested in new technologies. “Higher energy costs leave us less money for investment. And, if manufacturers can’t invest in Ontario, it’s not good for the economy or for jobs in this province. Ultimately, it’s not good for the environment either,” she said. Virtue signaling is not free. Ontario politicians want to look good to UN leaders, but the result is forcing employers to migrate jobs elsewhere. Until now politicians have naively bought into alarms from the Union of Concerned Scientists. Maybe they should pay attention instead to the Coalition of Concerned Manufacturers. ARLINGTON, VA—Explaining that readership of science-related articles and discussion of scientific concepts tends to surge at such times, a report released Thursday by the National Science Foundation confirmed that Americans are most interested in science when the moon looks different than normal. “According to our findings, citizens are never more engaged by scientific disciplines than when the moon does not look like it regularly does—for example, when it becomes big or bright,” read the report in part, which added that while the nation’s interest in science is typically fairly minimal and consistent when the moon is its usual size and color, as soon as these properties of the moon differ in a noticeable way, millions of Americans begin displaying a desire to learn and share scientific knowledge. The report went on to mention that major changes to the Earth appeared not to garner Americans’ interest at all. A Merry Christmas to all, and to all a peaceful night. It is not only US climatists alarmed about faithless political appointees to energy and environmental positions. Now some Norwegians are stewing. International Business Times article (here) A climate change denier has just been put in charge of melting Arctic island of Svalbard Per-Willy Amundsen has stated previously that he believes climate change to be a socialist ploy. Climate change sceptic Per-Willy Amundsen of the populist right-wing Progress Party has been appointed Minister of Justice and Public Security in Norway in a cabinet reshuffle. Amundsen does not believe that human activity is driving climate change, and says that climate change is used to disguise socialist policies, he previously told the Norwegian newspaper Stavanger Aftenblad. Norway’s Polar Affairs Department will fall under Amundsen’s brief, including administrative responsibility for Svalbard. The island is surrounded by the Arctic Ocean, the Greenland Sea and the Barents Sea, and lies between mainland Norway and the North Pole. It has been facing increasing challenges due to climate change in recent years. This is another crisis brewing for the climate movement because Norwegian officials are resolute believers in climatism, despite (or maybe because of) the oil wealth pouring into their sovereign fund. Norwegians seem conflicted about their oil wealth, going out of their way to proclaim their faith in climate change doctrine. For example, in the Exxon shareholder activist initiative last May, a large portion of supporting votes came from shares held by the Norwegian wealth fund. Another bunch of votes came from the Rockefeller family acting against management of the company founded by their patriarch. (Details here). Despite Amundsen’s stated views in the past, Norway’s prime minister Erna Solberg denied that she had appointed climate-change sceptics to her cabinet. “Everybody in this government believe climate change is man-made,” EUobserver reported Solberg to have said. The appointment raises questions about how Amundsen will address the problems of Svalbard, and other areas of Norway being affected by climate change. “Many of the challenges faced on Svalbard are related to climate change one way or the other,” Ivar Berthling, professor of geography at the Norwegian University of Science and Technology, told IBTimes UK. This is interesting also because of the recent deluge of media reports about shrinking reindeer on Svalbard (here). Fortunately for Norwegians, and for all of us, Norway has scientists who are not confused about climate change and have made their evidence and analyses widely available. Chief among them is Dr. Ole Humlum founder of the excellent climate information website Climate4you. Map showing the Arctic Gateway Seas within 20W-40E and 70-80N, for which the heat content within the uppermost 700 m is shown in the three diagrams, for East Greenland Sea, West Svalbard Sea and Barents Sea. 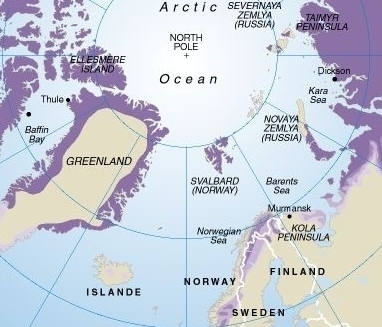 Svalbard archipelago, which includes Spitzbergen, is located at the gateway for Gulfstream Atlantic water entering the Arctic. Thus changes there are indicative of climate across the entire Arctic. As with other oceanic islands, like Australia, variations in land surface temperatures are synchronized with sea surface temperatures. During summer the daily meteorological conditions are highly influenced by the incoming solar radiation, which at 78°13′N are continuously above the horizon from 19 April to 23 August. Nevertheless, because of the nearby ocean, the air temperature usually stays relatively low, with July having an average temperature of 6.5°C (1981–2010). Summer air temperatures are also influenced by local wind conditions, partly reflecting land-sea breeze effects because of relatively small regional air pressure differences during the summer. All these factors are relatively stable from summer to summer. During winter the meteorological conditions are very different from the summer. The sun stays below the horizon from 28 October to 14 February, and there is very little incoming solar radiation from December to February. The ground is snow covered, and much of the surrounding ocean and fjords are covered by sea ice. So whenever calm conditions prevail, inversions tend to develop and temperatures will be low at Svalbard Airport. However, conditions are frequently windy during the winter, destroying inversions, and from time to time warm air masses are advected towards Svalbard from the North Atlantic. Whenever this happens, the air temperature will rise significantly, as much as 10–15°C within few hours. In winters with high frequency of such events, the average temperature will be high and vice versa in winters where advection of warm air masses occurs less often. Also local foehn effects may be important during the winter. Together, this explains the high degree of winter temperature variability compared to the summer variability. Advection of warm air masses from lower latitudes towards Svalbard occurs at all seasons, but is most frequent during the winter. 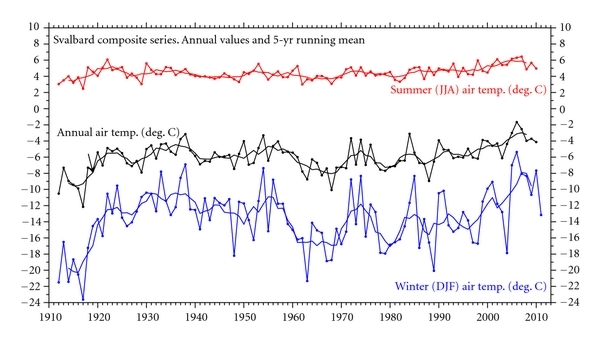 This explains why the Svalbard air temperature is well coupled to North Atlantic temperature conditions both in summer and winter, and why several oscillations can be recognised in the spectra of both summer and winter temperature records (Figure 5). Had this not be so, one would expect at least potential solar signals to be absent from the winter data. 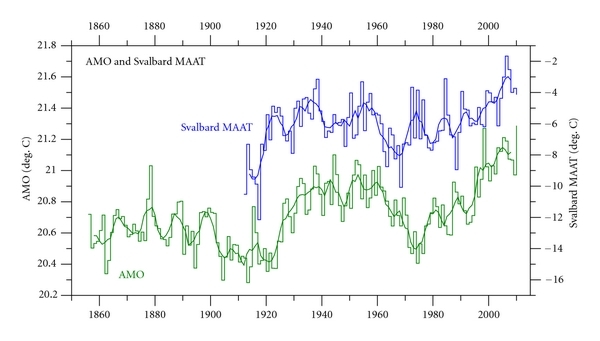 Figure 1: The Svalbard temperature record 1912–2010 , showing the mean annual air temperature (MAAT), the average summer temperature (JJA), and the average winter temperature (DJF). Thin lines show annual values, and thick lines show the simple 5 yr average. The linear MAAT increase 1912–2010 is 0.23°C per decade. Strength and persistence of several cyclic variations identified in the Svalbard temperature record suggests that a natural cycle-based forecasting of future climate may be feasible for the Svalbard record, at least for a limited time ranges. Our empirical experience suggests a forecasting time range of 10–25% of the total record length. For Svalbard our experimental forecast suggests that the observed late 20th century warming is not going to continue, but are likely to be followed by variable, but generally not higher temperatures for at least the coming 20–25 years. The falsification time scale for this forecast is about 7 years. Once again, climate confusion and angst is born by activists conflating human and natural influences on weather patterns. All five IPCC reports have proceeded to claim most or all of the warming since 1950 is caused by human activity, especially burning of fossil fuels. They express confidence levels of 95% or more, all the while dismissing natural factors and long term warming and cooling cycles without even analyzing them. Climate development with possible anthropogenic effects occurs on a background of natural climatic variations, which may be considerable, and especially in the Arctic. Natural climate variations however remain poorly understood, although they remain important for discriminating between natural and anthropogenic influences on current climate change. Natural cycles that have remained strong over long time are likely to continue without major changes into at the near future. Knowledge on such natural oscillations is therefore essential for forecasting future climate. 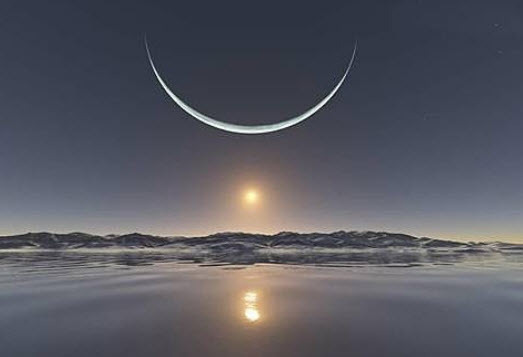 The darkest time of year at the North Pole is the Winter Solstice, this year on December 21. There has been no sunlight or even twilight since early October. The darkness lasts until the beginning of dawn in early March. The regrowth of Arctic ice extent was slower than usual until recently. After showing resilience in September, ending higher than 2007, ice growth lagged in October, but is now rapidly ramping up toward the averages. The map above shows the lack of ice is mainly in marginal seas close to the Atlantic and Pacific oceans. In the last 19 days, 2016 ice extent has grown by 100k km2 per day, compared to the 10-year average 70k km2 per day. As of day 355, 2016 ice extent is ~3% less than average (2006 to 2015). The chart also shows the variability of ice extent over the years during this month. 2015 was the highest ice recovery rate in the last decade, while 2006 ended up the lowest. The chart also shows 2016 Sea Ice Index (SII) from NOAA has been lagging behind by ~300k km2. The table below shows this year compared to average and to 2006 for day 355. The main deficit to average is in Barents and Greenland Seas on the Atlantic side, and in Bering and Chukchi Seas on Pacific side. The Canadian and Siberian sides are locked in ice, with sizable surpluses in Baffin and Hudson Bays, along with Okhotsk. The differences with 2006 are similar, though resulting in a surplus. The land of the Midnight Sun at Summer Solstice. There is no need to panic over Arctic ice this year, or any year. It fluctuates according to its own ocean-ice-atmospheric processes and we can only watch and be surprised since we know so little about how it all works. Judah Cohen at AER thinks the much greater snowfall in October will make for a very cold winter. We shall see. Just in time for Christmas, we have news of a worldwide outbreak of shrinking reindeer caused by global warming/climate change. 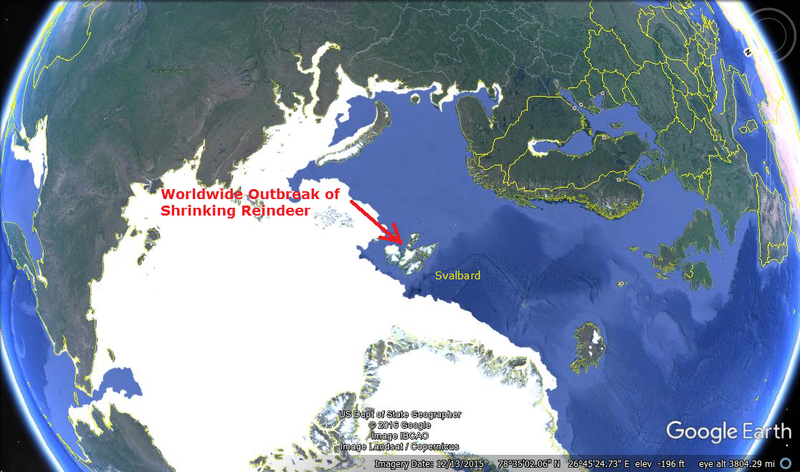 A websearch of “shrinking reindeer” returns links to hundreds of media reports from everywhere, evidence of the global nature of this event. That is, until you read past the scary headlines and discover that it is one story repeated endlessly. Once again, the internet serving as the global village rumor mill. We can relax somewhat in that reports from places like Malaysia, India and California do not mention the local reindeer, so they must be OK.
All of this attention and alarm arises from one report about one place: Svalbard (Arctic islands belonging to Norway). Moreover, the animals are not going extinct yet, rather a decline of 12% of adult body weight has been observed over the last 30 years. Project that out to the end of the century though, and the reindeer are toast, unless we do something. The females usually measure 162–205 cm (64–81 in) in length and weigh 79–120 kg (170–260 lb). The males (or “bulls”) are typically larger (although the extent to which varies in the different subspecies), measuring 180–214 cm (71–84 in) in length and usually weighing 92–210 kg (200–460 lb), though exceptionally large males have weighed as much as 318 kg (700 lb). Shoulder height typically measure from 85 to 150 cm (33 to 59 in), and the tail is 14 to 20 cm (5.5 to 7.9 in) long. The subspecies R. t. platyrhynchus from Svalbard Island is very small compared to other subspecies. Svalbard reindeer running in snow. The subspecies is endemic to the Svalbard islands, where it has lived for at least 5,000 years, and become well adapted to the harsh climate, being found on nearly all non-glaciated areas of the archipelago. It is the most northern living herbivore mammal in the world. The Svalbard reindeer is adapted to survive the variable climatic conditions and the high degree of seasonality in Svalbard. They are very sedentary and thus have low energy demands, and they have an outstanding ability to use their own body reserves (both fat and muscle tissue) when access to food is limited in the winter. The thick fur contributes to insulation against low temperatures and wind. Starvation is the most common cause of mortality. This occurs due to worn out teeth from grazing on sparse vegetation among stones and gravel or due to lack of food when ice locks pastures – caused by ‘rain-on-snow’ events in winter. The population dynamics of the Svalbard reindeer is regulated by a combination of density dependent processes and climatic variability causing high mortality and low reproduction. And there are large populations of reindeer outside of Svalbard, exhibiting remarkable hardiness. Some populations of the North American caribou migrate the furthest of any terrestrial mammal, travelling up to 5,000 km (3,100 mi) a year, and covering 1,000,000 km2 (390,000 sq mi). Other populations (e.g., in Europe) have a shorter migration, and some, for example the subspecies R. t. pearsoni and R. t. platyrhynchus (both restricted to islands), are residents that only make local movements. Normally travelling about 19–55 km (12–34 mi) a day while migrating, the caribou can run at speeds of 60–80 km/h (37– 50 mph). During the spring migration smaller herds will group together to form larger herds of 50,000 to 500,000 animals, but during autumn migrations the groups become smaller, and the reindeer begin to mate. And the hype goes on, amplified if anything to counteract the effect of an incoming US administration who dares to disbelieve in climatism. Last year there was much ado about Siberian reindeer infected with ricin and humans (one) dying from eating the meat. It turned out to be a report that is put out periodically, the timing associated with the governmental planning and budgeting cycle. Perhaps we will hear about this again in five years. Or sooner if Trump pursues a rational energy policy. One also wonders where Norway is in planning and budgeting for polar research activities. Of course, the reindeer are being recruited to replace the polar bears, who did not get the memo and instead multiplied their way out of endangerment. Two days ago I posted on Resurging Arctic Ice, and noted that most of the deficit to average was in Barents Sea and Hudson Bay. Look what happened yesterday in Hudson Bay. 2016 Arctic ice extent has now topped 12M km2, and continues to close in on the average for the last decade. 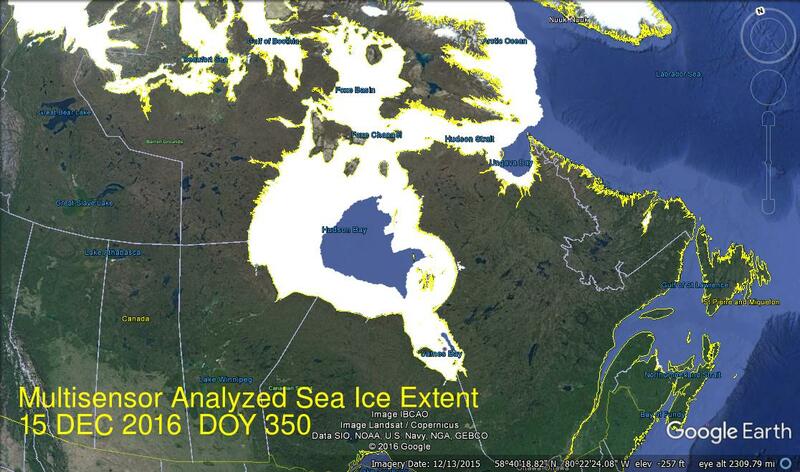 Sea Ice Index from NOAA is running more than 400k km2 behind. But the polar bears know the truth, and it has set them free. The Obama administration has been fighting climate change with a rogue wave of regulations whose legality comes from a very small base: The Social Cost of Carbon. A recent Bloomberg article informs on how the SCC notion was invented, its importance and how it might change under the Trump administration. In February 2009, a month after Barack Obama took office, two academics sat across from each other in the White House mess hall. Over a club sandwich, Michael Greenstone, a White House economist, and Cass Sunstein, Obama’s top regulatory officer, decided that the executive branch needed to figure out how to estimate the economic damage from climate change. With the recession in full swing, they were rightly skeptical about the chances that Congress would pass a nationwide cap-and-trade bill. Greenstone and Sunstein knew they needed a Plan B: a way to regulate carbon emissions without going through Congress. Over the next year, a team of economists, scientists, and lawyers from across the federal government convened to come up with a dollar amount for the economic cost of carbon emissions. Whatever value they hit upon would be used to determine the scope of regulations aimed at reducing the damage from climate change. 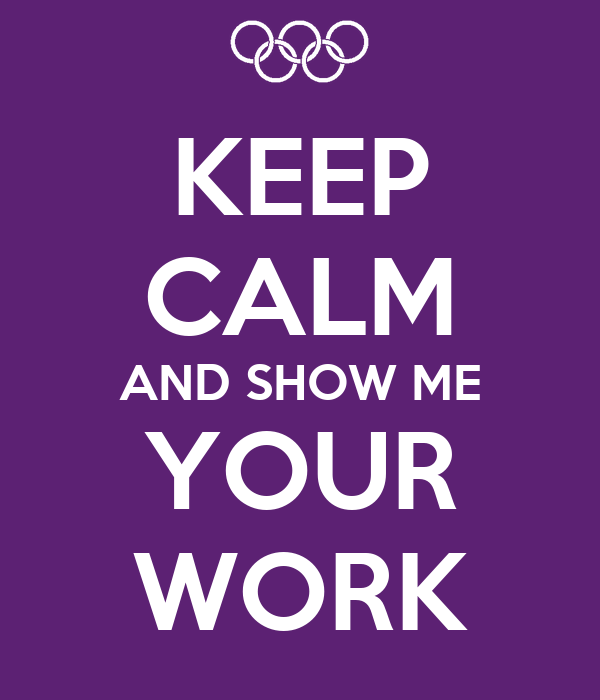 The bigger the estimate, the more costly the rules meant to address it could be. After a year of modeling different scenarios, the team came up with a central estimate of $21 per metric ton, which is to say that by their calculations, every ton of carbon emitted into the atmosphere imposed $21 of economic cost. It has since been raised to around $40 a ton. Trump can’t undo the SCC by fiat. There is established case law requiring the government to account for the impact of carbon, and if he just repealed it, environmentalists would almost certainly sue. There are other ways for Trump to undercut the SCC. By tweaking some of the assumptions and calculations that are baked into its model, the Trump administration could pretty much render it irrelevant, or even skew it to the point that carbon emissions come out as a benefit instead of a cost. 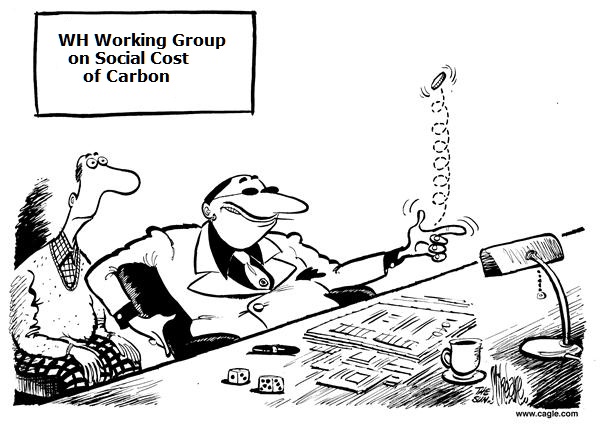 The SCC models rely on a “discount rate” to state the harm from global warming in today’s dollars. The higher the discount rate, the lower the estimate of harm. That’s because the costs incurred by burning carbon lie mostly in the distant future, while the benefits (heat, electricity, etc.) are enjoyed today. A high discount rate shrinks the estimates of future costs but doesn’t affect present-day benefits. The team put together by Greenstone and Sunstein used a discount rate of 3 percent to come up with its central estimate of $21 a ton for damage inflicted by carbon. But changing that discount just slightly produces big swings in the overall cost of carbon, turning a number that’s pushing broad changes in everything from appliances to coal leasing decisions into one that would have little or no impact on policy. According to a 2013 government update on the SCC, by applying a discount rate of 5 percent, the cost of carbon in 2020 comes out to $12 a ton; using a 2.5 percent rate, it’s $65. A 7 percent discount rate, which has been used by the EPA for other regulatory analysis, could actually lead to a negative carbon cost, which would seem to imply that carbon emissions are beneficial. “Once you start to dig into how the numbers are constructed, I cannot fathom how anyone could think it has any basis in reality,” says Daniel Simmons, vice president for policy at the American Energy Alliance and a member of the Trump transition team focusing on the Energy Department. Another issue for those who question the Obama administration’s SCC: It estimates the global costs and benefits of carbon emissions, rather than just focusing on the impact to the U.S. Critics argue that this pushes the cost of carbon much higher and that the calculation should instead be limited to the U.S.; that would lower the cost by more than 70 percent, says the CEI’s Mario Lewis. The regrowth of Arctic ice extent was slower than usual until recently. After showing resilience in September, ending higher than 2007, ice growth lagged in October, but is now rapidly ramping up toward the averages. 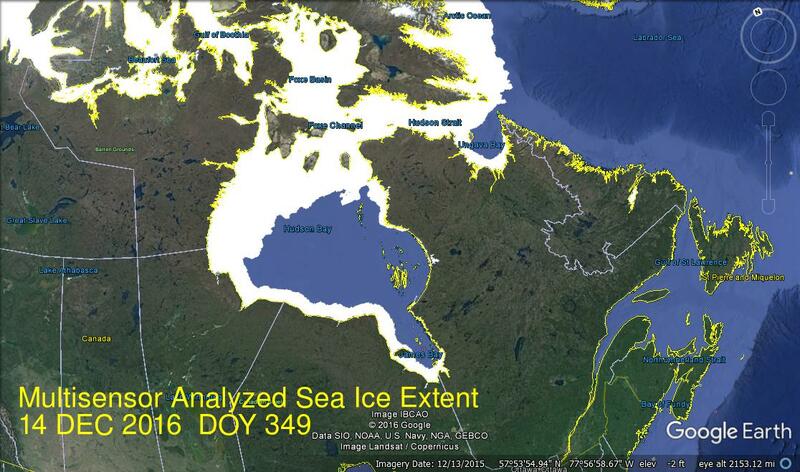 The map above shows the lack of ice is mainly in Hudson Bay and Barents Sea. Kara, Bering and Chukchi seas have all rebounded and everything else is locked in ice. In the last 24 days, 2016 ice extent has grown by 123k km2 per day, compared to the 10-year average 79k km2 per day. As of day 348, 2016 ice extent is ~3% less than average (2006 to 2015). The chart also shows the variability of ice extent over the years during this season. 2015 was the highest ice recovery rate in the last decade, while 2007 was the slowest. The chart also shows 2016 Sea Ice Index (SII) from NOAA has been lagging behind by more than 300k km2. The table below shows this year compared to average and to 2007 for day 348. Most of the deficit to average is in Kara, Barents, Greenland Sea and Hudson Bay. Central Arctic, CAA, Bering Sea and BCE are all average, while Okhotsk and Baffin Bay are showing surpluses. Presently 2016 ice extent is 260k km2 greater than 2007 with large surpluses in BCE, Baffin, Bering and Okhotsk Seas. Only Hudson Bay and Kara were larger in 2007.